If you’ve ever wondered what it would be like to step into the shoes of an absolute psychopath and kill numerous innocent civilians (and a cop or two for good measure), it’s a good thing Slayaway Camp exists. If, on the other hand, you don’t enjoy ultra-violent experiences… this one might not be for you. Still reading? 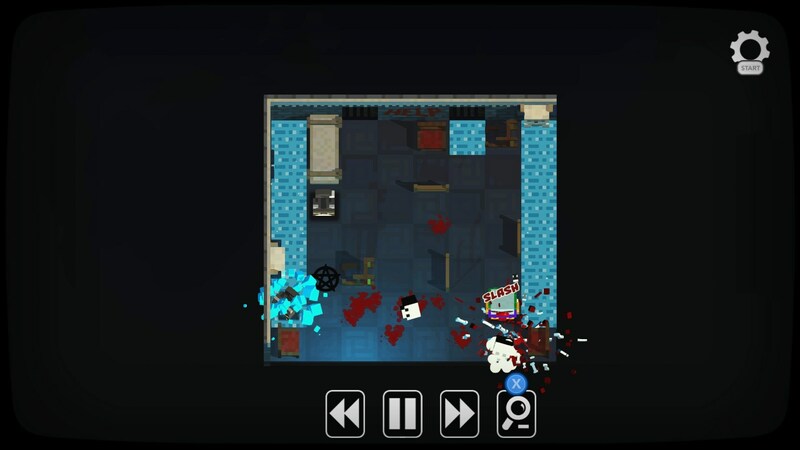 Good, because in my opinion, this slide puzzler turned gory murder simulator is pretty damn awesome – even if it clearly isn’t for the faint of heart. Then again, one could always flick the ‘everything is flowers, rainbows and cute puppies’ switch, I suppose. But since I played the game for review purpose, I went through it as intended. Or rather, through a fair amount, until I found myself too challenged to continue. 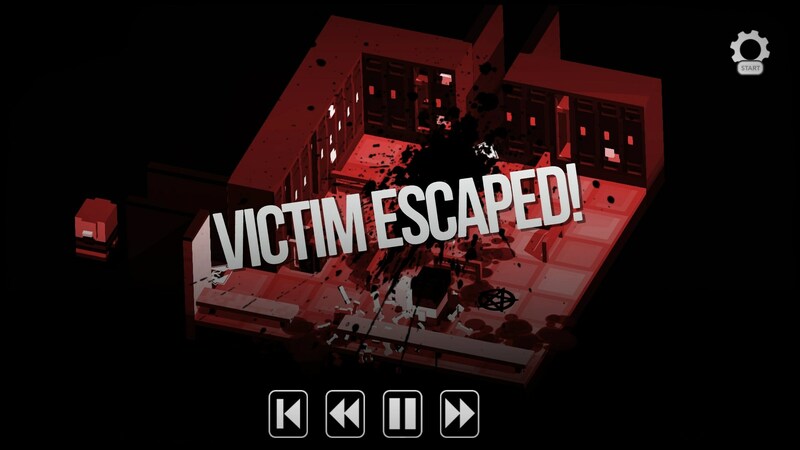 And you better believe that being a serial killer in Slayaway Camp, while oddly enjoyable, is anything but easy. Don’t let the early goings fool ya, during which you’re simply sliding around small areas, not a care in the world, one or two victims to deal with. Those carefree murder sprees are just the beginning. But I’m getting ahead of myself, so let’s take it from the top. 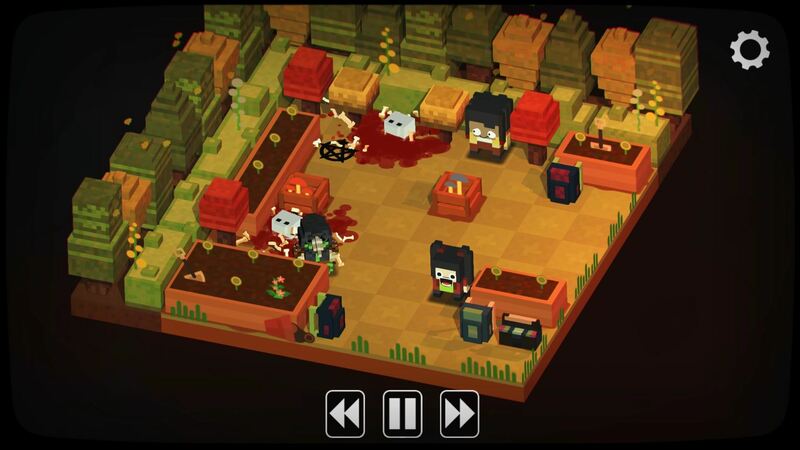 In Slayaway Camp, you play the part of ruthless murderer, and that’s just the way it is. Your job in each of the game’s hundreds(!) of scenes (read: levels) is simple: kill civilians without getting killed in the process, and reach a designated area to escape. Nothing too demanding… until the game starts throwing one curveball after another. Cops, SWAT members with laser sights, land mines, phones and much more all has to be taken into consideration when planning your route, seeing how, well, once you start moving, there’s no stopping until you hit something. Hopefully it’s not a land mine, the tile in front of a cop, the laser sight of a SWAT guy or water, as those will all kill you. Immediately. No QTE to dodge or other such fun stuff. Nope. Just a game over. Fortunately, you do have the power to manipulate time, retracing your steps one by one if mistakes are made. Doesn’t matter if it’s your untimely demise, a victim escaping, a cat dying, or simply a move you’d like to take back – the press of a button will rewind time and undo any of those. Oh, did I forget to mention how cats are not to be killed, just like how no one is allowed to escape? Yeah. Life of a killer ain’t easy, but man is it ever violent. During my time with the game, I set cops ablaze, smashed youngsters with bookshelves, watched someone get eaten by piranhas, blew up several innocent elderly women, and even threw a guy or two into a spiked pit. 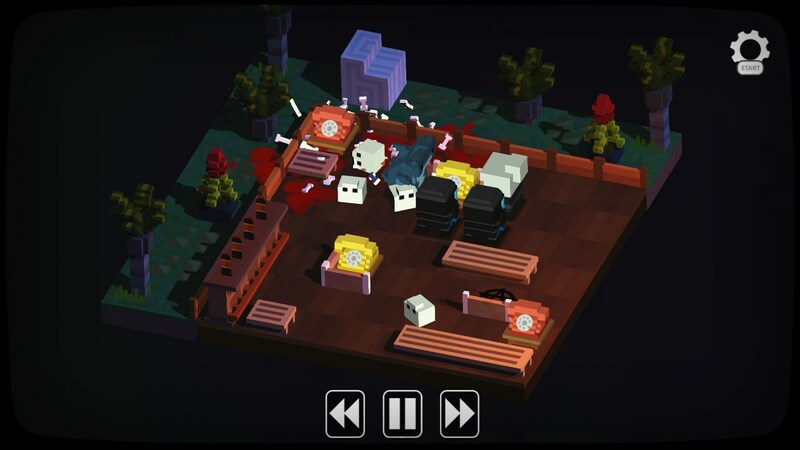 Depicted in colourful voxel graphics, this adorable murderer slides around isometric puzzle levels decapitating, squashing, and perforating his blocky victims. It’s a diabolical logic game that also happens to be a bloody tribute to eighties trash horror. Now, as for why I would do such horrible things, well, haven’t you heard? I’m the killer in every last one of these movies. Doesn’t matter if it’s Slayaway Camp, Return to Slayaway Camp, (Another) Return to Slayaway Camp, Slayaway Camp 3D, or any of the other sequels. I’m always the killer. I might be a dude with a hockey mask, a school teacher, an old woman, or even a clown – doesn’t matter, always the killer. Killing is my business, and business is good! Less so for my victims, I suppose, but that can’t be helped. Besides… it’s all acting. Until it isn’t. Or something. Right. Anyway, at this point, I’ve lost track of just how many unfortunate souls I have sent to the next world, courtesy of blunt objects, sharp tools, environmental hazards and… other… things. But if there’s one thing I’ll never forget, it’s how slippery the floors always are. From construction sites to schools, forests, and even the beach – always slippery, always making me slide around like… I don’t even know. Not that it ever prevented me from reaching my prey, mind you; it simply delayed the inevitable. Heck, there were times when even hiding behind a solid object didn’t help, as me sneaking up on someone would cause them to scream and immediately run away. Even if said object was a wall too short for me to climb, yet high enough to peak over. Go figure. Bunch of scaredy cats if you ask me, although it did – at times – make my job easier, as this enabled me to manipulate the location of my victims, creating new slippery paths in order to kill otherwise unreachable targets. Just had to make sure I never scared a cat into a campfire, a watery grave, or a land mine, as getting those killed would cause me to instantly fail the current… scene. Which happened more than I’d like to admit. Stupid cats. On a related note, laying waste to someone is as easy as either bumping into them, or scaring them into one of the aforementioned hazards, as they too will continue to move until bumping into something – or dying. Oh, and phones are awesome. They may be of the super old-school sort in Slayaway Camp, but that doesn’t mean they’re useless. Quite the opposite in fact, as these – like getting up close and personal with someone – will cause anyone within earshot to relocate, perhaps even turn around! Needless to say, an incredibly useful feature, if used correctly. Yet at the same time, something that could easily mess everything up. So… who ya gonna call? No one, that’s who, because I make the calls around here! Seriously. Don’t touch that dial. When you’re not overly busy gutting everyone in sight, might I recommend spending those hard-earned skull coins on additional killers? You know, in case you get tired of being that same ol’ manshark (wait, what?). Or, if you feel like the main movies aren’t interesting and/or challenging enough, there’s always the ‘deleted scenes’, which are guaranteed to put all you’ve learnt so far to the test. More cops, more SWAT members, more holes in the ground, more maze-y areas – everything’s ramped up in these. Probably why they were deleted in the first place. Audience can only handle so much. Unfortunately that goes for me too, as I’d had enough of the game’s puzzles long before the grand finale. While I was still having fun during the sixth movie, the amount of pre-planning required to beat some of those levels was just too much for my brain to process. I could just have skipped those by using the built-in ‘cheat’, although chances are I would have ended up using that time and time again, as surely the difficulty was only going to go up from that point onward. Besides, I’d racked up a sufficient kill count by the time I decided to change my ways and leave Slayaway Camp behind, blood and guts leaving a lengthy trail in my wake. Or… something along those lines. That said, there really isn’t anything quite like Slayaway Camp, in spite of the gory horror market being absolutely flooded these days. Especially since, you know, most of them don’t cast you as the killer, but as a mere potential victim instead. And that’s just one reason for me recommending this game. Another would be that it is absolutely packed with content now, considering the amount of post-launch additions, making it perfect for fans of horror puzzlers. Could always turn off the gore after all, should you want something clean instead. Don’t see why you would, though. BRUTALITY! YEAH! Slayaway Camp is available for Windows (reviewed), OS X and Linux from Steam ($8.99), and iOS ($2.99) from iTunes.